Miscarriage. Stillbirth. Please, Don't Shy Away. Miscarriage. Stillbirth. Please, Don’t Shy Away. Women love to talk about and dissect almost any topic you throw at them. I love that about my gender. We are open and interested and willing to spread our collective knowledge around to help each other. Yet, there are still a few topics that even we shy away from discussing: Miscarriage and, harder yet, stillbirth. Lawsy. My heart is pounding and my eyes are wet, but I suggest we tackle the beast and prove to ourselves that this painful vulnerability is worthy of our words. Who among you knows of a woman who has suffered a miscarriage? If I asked for a show of hands, many of you would offer yours. Maybe you’re the woman you know. I know I am. My story is simple. A year or so before I married I was told by a doc that it would be statistically impossible for me to conceive. Most likely, I would never carry a baby. The news was devastating. I was angry and upset; in my jumble of confused emotions, I thought they were teasing me. Um, yeah, no, you’re PREGNANT! Simply writing the words causes the raw emotion of that pinpointed moment, the unbelievability, the SURPRISE!, the giddy Scoobey-Doo head fake, to come barreling back as a tsunami of gratitude. I was pregnant! We were having a baby! We were scared and excited and truly dumbfounded for a few weeks. Boy was born and we were blessed beyond measure. Docs can be wrong. For me, my faith told me that if God wanted me to have a child, there was no diagnosis that would stand in the way. With Boy’s birth, we thought we were done. We had our miracle. We were OK with the idea that one was the magic number. 14 years later we were surprised with another pregnancy. WHAT?! This time, when I was told, I actually came close to passing out at the nurse’s station. The pregnancy test that was standard when you’re a young woman seeing your gynecologist, the positive results of such a routine don’t-think-about-it-just-pee-in-the-cup test, surprised us all in that little room. I remember blinking hard, my brain trying to process the impossible words spoken, then the room going dark. The nurses sprang into action. Once I could think again…could talk again…I cried and they laughed in joy (and probably in response to my response) . I can’t begin to articulate what I felt. TWO KIDS! A mom of two kiddos. Omgosh, that’s gonna be me! Then, on Thanksgiving day, 14 weeks into the pregnancy, I started spotting. I immediately stopped baking pies and called my doctor. I was told to get off my feet and to keep an eye on things. I had experienced some bleeding and cramping during my first pregnancy, so it wasn’t completely worrisome. I sent my family off to the family feast, reminded them to bring me a plate and laid in bed praying for my sweet baby girl. It was too early to know for sure, but in my heart I felt certain I was carrying a girl, just as I had felt certain Boy was a boy. As the day progressed, my spotting became more pronounced to actual bleeding. I checked back in with my doctor and from what I relayed, he believed I was miscarrying. He advised me to continue to rest. Rest? My baby was in peril and I was supposed to rest? For the first time since becoming a mother, there was nothing I could do, but wait. It’s a twisted kind of agony to know that the life within you is passing from this world to the next and there is nothing you can do but wait. I knew the moment my pregnancy ended, and even now, at this very moment, the deep emotion has the power to bend me to almost breaking. My baby girl was gone. Only days before, we had announced to our family and friends that we were expecting (much to everyone’s surprise!) and now we’d have to tell them that I had miscarried, except in language that was less blunt and less painful for them. For months I grieved silently. I wanted to talk about it, to talk about what I experienced, but I didn’t want to make those around me uncomfortable. Life was moving on, but I wasn’t, until two amazing things happened. One: a dear friend suggested we name the baby, acknowledging that she was a part of our lives and always would be. Two: another friend suggested a ceremony of letting go, with drums and chants and tearing of cloth (if need be). She suggested we could write down our pain, then burn it in a fire pit and watch as the healing smoke rise to Heaven. We didn’t do either one of these things, but I was so grateful to both of those friends for taking the risk to talk to me about the miscarriage. As I had found out after my miscarriage, everyone was loving and concerned, but no one dared mention it again. I’m sure they didn’t want to hurt me by reminding me of my pain,or maybe they didn’t know what to say, but I never stopped thinking about it. Miscarriage is devastating. A death. Who wants to talk about death over coffee and cake? I’ll tell you who: every woman who has suffered through one. As miracles go, we thought we were done with pregnancies. Matter of fact, we had two more, and then two more miscarriages. For women in their childbearing years, the chances of having a miscarriage can range from 10-25%, and in most healthy women the average is about a 15-20% chance. That’s a lot of women. A lot of suffering. A lot of love waiting to be expressed. My prayer, my hope, is simple: Let us not shy away from each other when the subject is miscarriage or stillbirth. 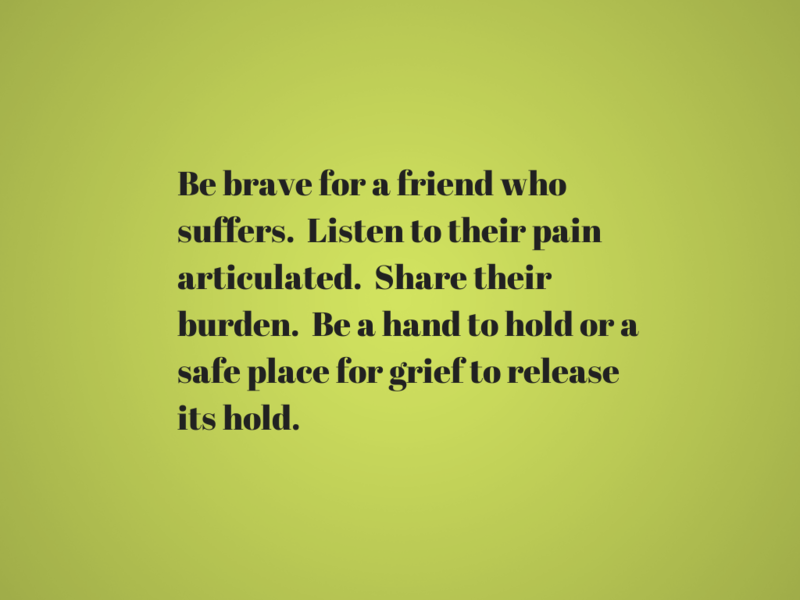 Let us embrace our love, our gift, of talking about and sharing our pain, even in the face of extreme discomfort. Hell, especially in the face of that which scares the holy hell out of us and makes our heart ache. Talking of stillbirth seems even harder to me. I don’t know anyone who has experienced it, so I defer to those who have. Please watch this video I found posted at Sugar and Dots discussing miscarriage and stillbirth. It is heart-wrenching and beautiful. Someone once said to me: Miracles come from death. Watch, and you’ll bear witness. She was right. My miracles arrived as two friends who pushed past their fear and gave me more than they intended. Their lesson became my action; reach out to those who suffer this silent loss. Are these tough topics to discuss? A million times, yes. But, we are women; we are warriors. We bring life forward and shape the future. Whatever you do, please, don’t shy away. About a month ago I went to the graveside service for a friend whose baby was stillborn. She was 39 weeks and I can only imagine her heartache. Having that experience happen to someone I know has definitely changed me and how I interact with women who have lost a baby. A mother’s pain felt by all mothers. It’s terrifying to imagine ourselves in that position, but I’m thankful that the experience has changed the way you approach the subject. Thank you for coming here and sharing this with us. Thanks for sharing. This is truly one of those subjects you don’t truly understand till you’ve been there, but it does help to make others aware of it so they can be as sensitive as possible when they know someone experiencing this. My first loss I never told anyone till years later. My second one was later in the pregnancy, after everyone knew, and I think what made the situation doubly hard was the QUIET of everyone around me. I was grieving alone because others just did not know how to react to my loss. Posts like this will help others know what to say and to do help, so thank you. I think I’m going to cry through every comment, especially those like yours. Thank you for sharing your experience. The quiet of those around me was so unexpected, but as with a death of any kind, folks don’t want to say the wrong thing, so I I never blamed them. I could understand. But my suffering just went on, and I felt so alone. Thanks for sharing. I’ve also had them. It might be caused by eating gluten. Have you been checked out to see if you might not tolerate gluten in your diet? I am past the age of having babies (well, almost! ), but I have not checked. I have never heard of this particular cause. I miscarried our first child. Since my mom, grandmas and aunts all miscarried I just assume it was a genetic issue. It was so sad and hard, especially with my momma 800 miles away. I blamed my self. There was so much silence with an occasional rude comment, not intentional, but painful none the less. But I know to this day God had a plan. He blessed us with two healthy babies who mean the world to us. From profound sadness comes great joy! Debbie, I had no idea and I’m so sorry that your experience was that of so many. It’s true that having a baby after such a loss, makes it sweeter. Thanks for being so open and sharing your story. Thank you so much for sharing what I know is a difficult story to tell. It would be great if women felt more comfortable speaking about miscarriages and stillbirths and could create a network of support with other women. That is my prayer. Let us be the start. Thank you for joining this important conversation. Thank you for sharing your story at Bacon Time. I knew a women who had a still birth, and she was aware it was going to happen. The doctors convinced her to go full term, since she would be able to donate babies organs to some child in need. Then once the baby came they told her none of the organs were useful, so she went full term for nothing. I felt so bad for her. All that time folks asking to rub her belly, what she was having, and she would have to sigh and explain her sad story once again. I didn’t know what to say to her at the time. I am thankful for your post, and in the future I will put myself out there more for women in the same situation. Mindie, I am so thankful that you opened you heart for others, even if you didn’t know what to say to your friend. It’s important that we take each experience and grow from that…and you totally did. It’s a heartbreaking story and I wish your friend peace. I haven’t experienced this personally, but am surprised at how many of my friends have, long before we were friends. My mom experienced the death of her 3 day old son, what would have been my older brother. Although I wonder sometimes if I’d be here if things had been different. He’s not talked about much, but my grandmother brought him up to me a few weeks ago. I think most women who have experienced a miscarriage or stillbirth are open to discussing their experience, but shy away from bringing it up because of the pain and uncomfortableness it causes others. We are ever the comforters, aren’t we? I hope you could talk to your grandmother about her and her daughter’s pain. After my second child and my husband’s fourth, I found myself pregnant agian, and I was NOT overjoyed, I know that for some the pain is from not being able to have children, but I had two teens and two babies on my hands, we were not well off financially, to say the least, and I had my hands FULL(!). When I miscarried, the guilt was overwhelming, if I had been wiser I would have known that pregnancies that begin less than 6 months after birth often end in miscarriage, but I felt, no KNEW, that it was my fault, for not being happy about it, somehow my feelings killed my baby. I carried that for over a decade before I untangled the emotions from the logic and forgave myself those feelings. I also felt guilt, like it was my fault some how. I hear over and over again that so many women believe this needless pain. I’m sorry you carried that burden for so many years, but happy that you’ve come to a place of truth. Thank you for writing this beautiful post. I lost a little one after my tubal reversal surgery. It was an early miscarriage, around 7 weeks. I still keep the pregnancy tests, even though it’s been four years. I can’t bring myself to throw them away – it’s all I have to show for that little one. And because I have six children, with number seven on the way, people think it’s not such a big deal for me. After all, I have so many already, right? And it was an early loss… But it matters to me. I still think about that little one. I still remember vividly reaching into the toilet, trying to find my baby, wanting something to hold. It’s so heartbreaking. I think my husband forgets sometimes. And I understand. It wasn’t real for him. But it was real for me – and there was no one to talk to about it. It matters. Each one matters, no matter how small or how early. I also remember the need to “see” or find my baby. It’s a protective mommy response, I think. I’m so sorry for your pain and your loss. I also thank you for sharing your story’s details, especially for those who can’t. I’m so sorry. Thank you for coming and sharing yours, as well. “Don’t shy away.” Truly words to live by. Sometimes we avoid situations because they make us feel uncomfortable or sad or we don’t know what to say. You remind us that these are exactly the times we need to step up to support our friends and daughters. Beautifully written. Thanks, Mo. Showing up for each other is an underestimated gift, especially in a tough situation. i had three miscarriages. two still births… twins. I will NEVER forget… but I was able to move on and try again because of the love I received. What a heartache. I am profoundly sorry that you had to endure such a painful experience. I just told a young woman this evening that if we had experienced miscarriages before our son had been born, we would have still continued to try. Thank you for sharing your story and for pointing out that you could move forward because of love received. I am sorry for your heartache from your loss and all losses. Suffering through a total of three miscarriages, two of which were in the second trimester, I did find that it was helpful to discuss what happened with some people. However, others would have been better keeping their mouths shut. Phrases like “it was for the best’ or “you should just get over it” were particularly irritating. The “you should just get over it” was probably the worse since it came from someone that thought I should get over it but who still mourned the passing of various people (husband, mother, grandmother) over 25 years after their deaths. Gee, thanks mom, you sure know how to help your grieving daughter. Nine and ten years later I still can’t talk about it with her. When folks don’t understand how women can grieve deeply over miscarrying, I always point them to the losses they have suffered through death. A friend offered this observation to the conversation yesterday: It’s the loss of a dream. The loss of possibilities. To which I added: …the loss of a part of you. I’m sorry your mom couldn’t understand that; I’m sorry for your compounded pain. Every one of my close friends have suffered a miscarriage, some more than one. As a mother I cannot phathom such a deep loss. I’m sorry for your loss and I hope to be a more sensitive friend and lend comfort where I can. Thank you for sharing your stories. You’re welcome and it gives me comfort to know that you’ll pass along the love. I know quite a few women who have miscarried and lost a baby shortly after arrival. My pain in my heart is unbearable when I hear these tragic stories of real women. I also had a miscarriage. At about three months. I spotted. Just a bit. My doctor told me to rest and stay off my feet. The spotting continued so my Doctor had me go in for an ultrasound. The technician didn’t have to say anything. We could tell by the look on her face. She wouldn’t let us look at the screen. I had to wait a week before the hospital could get me in for a DNC. (Not sure if that’s what it’s called.) A whole week. I was horrified. My still baby inside of me. That’s for giving us a means to share our stories. Thank you for sharing your story with us. I think I can speak for all of us in saying I am so sorry that you had to go through that trauma. I’m sorry she wouldn’t let you look at the screen. Like you, I had an embryonic demise that wouldn’t miscarry on its own, at 7 weeks. I had a routine “to date the pregnancy” ultrasound where they told me it was exactly the right length for the gestational age I had estimated, but at that age its heartbeat should be visible and it wasn’t. I waited 12 days to be sure, as there’s about a 10% chance of them being wrong about that–sometimes the heartbeat can’t be seen until later. I had not a drop of bleeding, not a bit of reduction in pregnancy symptoms, so I was hopeful. But at the next ultrasound, I could see immediately that the embryo was dead yet I had kept growing the cord and sac for it. I will never forget seeing that umbilical cord as a long, curly line of bright dots representing my faith and hard work as that sad little dead thing moved farther away from me. I’m so glad they let me see it. The operation is called D&C, which stands for dilation and curettage. It’s the only thing to do when a pregnancy isn’t miscarrying naturally (because if you leave it there, it can cause blood poisoning) but it causes a horribly sudden end to the hormonal state of pregnancy. I wasn’t right for about 4 months. Mrs. Tucker, thanks for writing about this! I feel very lucky to be part of a very supportive church, where several families have had miscarriages and were so emphatically THERE for me and saying all the right things. I’m pregnant again now–17 weeks–and everything seems to be going fine, but it is so hard not to worry!! Becca, you are welcome and I will pray for your pregnancy. I have a prayer book that gets prayed over daily that I will enter you in. Thank you for sharing with us and supporting Darlene. Your honest words have opened a cathartic floodgate. Thank you for addressing this topic and changing my own reaction to past – and future – incidents from uncomfortable silence to a gentle offer of being there to listen. Years ago, when my sister miscarried, my mother, who meant well, advised me to not contact her because the fact that I had a newborn might cause her pain. Mother had miscarried after three daughters and didn’t want to be around someone who’d just had her own. To this day, (we’re grandmothers now) my sister feels the pain of my silence at that time and there is nothing I can do to relieve it. I am happy that your own circumstances did result in a wonderful son – and an adorable grand baby! Joyce, thank you for sharing this. It highlights the absolute need for us to show-up in times of pain, even if it is only to offer silent support through listening. I’m sorry that your mom’s advice wasn’t what your sister needed from you. I know the pain of silence is tough, but I’m hoping that your sister can come to a place of understanding about it. When I think back over my experiences, it makes having a son, and now a grandbaby, even more incredible. Thanks for joining this difficult conversation. I’m so sorry for your loss. People don’t know what to say. They can’t ease the pain and they are deeply sympathetic to your loss. Thanks for sharing what does help – just being a friend, accepting where you are. It’s so true that folks are rendered into silence because they don’t know what to say, but no words that are necessary other than “I’m sorry” to ease the sorrow of another. Thanks for joining us. Thank you for speaking up on a tough topic. Our son and DIL suffered a miscarriage with their first pregnancy (they have since had three successful pregnancies) and besides not knowing what to say, I seriously underestimated how devastating it really was for them. Some years later, my son referred to it as the worst day of their life and after reading your article, I understand better what he meant. Being a man, I will never know what it was like to go through this terrible thing, but I do have a better sense of it now. Thank you. I know it’s tougher for guys to understand this subject, at times. I love that you’ve come to a fuller understanding of what your kids went through. Those who have experienced either a miscarriage or still birth never forget the pain, but it’s always nice to know that others are in their corner, no matter how much time has passed. I appreciate that you not only read the post, but stepped forward to join the conversation. Thank you. I’m sorry to read of your loss and thank you for sharing and sharing so poignantly. You are right – we tend to shy away from situations that make us uncomfortable or where we don’t know what to say. My sister lost a baby girl moments after birth and she said the same thing – no one wanted to talk about it or said things that were insensitive like, “well, you can always have another.” Oh my. I don’t even know that it’s that important to say anything – but just to be there and listen. You hit the nail on the head: it’s not as important to say anything as it is to just be there and listen. We have all been in the uncomfortable position of not knowing what to say or how to comfort, but when in doubt, a warm body to sit by, someone to listen, is better than pretty much anything else. Thank you for the great thought. I’m so sorry for your loss, and thank you for posting this. You have me boo-hooing over here, remembering my two nephews that were born stillborn. One was revived after almost an hour and by the time he started breathing again, he had no brain activity. That was harder than the one that was born stillborn and never took a breath, because we had to hear twice that he stopped breathing. Looking back, God gave my sisters so much grace to get through it, I felt like I was having a harder time with the loss then them. Both sisters have been blessed with more kids, and the ones they lost are still talked about and still thought of often. I don’t think I talked of it often in the beginning in case it hurt them to think about it, but a couple days after the second nephew passed away, my brother got us all together as a family and him and his wife talked to us about how they were feeling, that they didn’t want this to discourage us from having kids, and that they were okay with what God’s decision was, and that it was going to be hard for a while, and they needed us to be there for them as much as we could. Your brother and his wife…what they did for you in the midst of their grieving…I’m blown away. What grace and strength. I too am sorry for their loss and yours. The experience never leaves you. To this day, I think of that baby often, especially when I see a child about the age she’d be now. It’s OK. I’m OK. But, know for your brother and his wife, it will always be a part of them. Thank you for sharing this with us. Oh, I’m so sorry for your loss, but am so glad that you have reached out and posted this. It’s true, even after many years, it is still cathartic to talk about it. I had two miscarriages, both after my second (and last) child was born. The first miscarriage was a complete surprise but I did have a supportive husband and a wonderful friend who helped me through it. My mother never knew my children but I felt that she was looking down from Heaven and enveloping me in a warm hug. When I became pregnant again a year or so later, I didn’t mention it to anyone except my husband and my midwife. I wanted to wait and sure enough, five weeks into the pregnancy, I miscarried. Even though it was early on, it was still devastating. These miscarriages were about 25 years ago but they each feel like yesterday. Not long ago, I told my daughter (who just turned 30 and has given me a beautiful granddaughter) about the miscarriages — it was wonderful to share those sad times with her. She mourned the loss of those babies along with me that day. Thank you so much for reaching out to all of us. I have read and cried through each of the comments — my heart goes out to each and every one of these brave women. It is my belief that the souls of each of these tiny babies are waiting for us in Heaven, and we will meet them then. I’m also sorry for your losses and like you, I believe they are waiting for us. I love that you opened up to your daughter and that she felt your sorrow. Well done, momma. What a beautifully well-said response. Thank you for that and I am so sorry that you know this pain so personally. Thanks for sharing this post. I am sorry for your losses. My husband and I lost our daughter, Esther Kate, last February. We went in for a routine appointment at 16 weeks (after 3 perfect ultrasounds) and there was no heartbeat. To say we were devastated doesn’t even scratch the surface. I was induced and gave birth to my tiny, perfect daughter. Immediately upon birth it was evident that she died from a rare cord accident. We are so thankful for the time we got to spend holding, rocking, loving, and saying goodbye to our little girl. The pain over the last nine months has been more than anything I ever imagined. It. Miscarriage and stillbirth are just not talked about, yet you are exactly right that as a mom who has lost, all I want to do is talk about my baby who died. I started a blog to talk about it for my own processing and to help others understand even just a little. Thanks again for talking about this sensitive, yet very important part of many of our lives. It was heartbreaking to read your story, Kalyn. I’m so sorry. You are right that this is such a sensitive issue and one that people shy away from because death is a difficult subject in our culture. I’m encouraged by how many have opened their lives and experiences here along with you. May we continue our courageous steps forward and bring this pain into the light of each others love. Thank you for not only coming here, but for sharing your story. I’m sorry for the losses you suffered. Each telling adds to the whole. Thank you. Great story, and im sorry to hear about your little girl! After trying for 3 years we got pregnant, I had an ectopic at 9 wks it was the worst day of my life. But it brought us all closer and to this day i never forget about my little bean! Thanks for sharing! Those little beans rule our hearts, don’t they? I have lost our 1st at 16 weeks, then had my son and 21 months later my daughter, followed by three more miscarriages of which the last was the worst as I knew my baby was dead but had to wait 4 days before they could operate. Thank you for sharing. Oh, Linda, worse than knowing, must be waiting. I’m so sorry. I finished reading this and watching the video, and in a snotty tear-soaked mess I hugged my 10 month old son just a little tighter. I haven’t lost a child, but my heart absolutely aches in pain at the idea, and I cannot even begin to imagine what others have to brave through that have gone through this themselves. There are just no words. I’m so sorry you have experienced this loss – thank you for sharing, it helps me to know how to be there for others that go through it. I am so sorry for your loss. I can only say that as time goes on the pain becomes tempered, although never ceasing. I miscarried our third child at 11 weeks and went through a deep period of grief that no one, outside my husband, seemed to understand (of course, women’s health issues were hardly mentioned in the early 90s). Then last year, we lost our beloved first born, our daughter Amy at age 28, to a lifelong genetic disorder. It has been devastating beyond belief. To be able to talk about her openly and her life here and the impact she had on so many is a gift that we are often denied. People don’t want to talk about death and those who have died tragically. Maybe we can be an instrument of change. May the Lord bless you and yours! I’m visiting from the Clever Chicks Blog Hop. Women’s health issues have come a long way and for that I’m grateful. “Instrument of change” resonated with me…how I pray we all take small steps in that direction. I am sorry for the loss of your children. I pray that you are able to find a friend to talk with about Amy. We experienced a friend losing their child at an early age, over 20-years-ago, and she is brought up in many conversations. Once a part of us, always a part of us. This is so beautiful. I have been there, and it is heartbreaking. I talk about it, but your right, other people don’t say anything, and I think it’s because they are afraid of causing more hurt. Thanks so much for sharing with Wednesday’s Adorned Link Party. Have a great Thanksgiving. I think so, too. I’ve never blamed anyone for their silence, as I had been guilty of it. My hope is to give courage to those who might otherwise remain silent. Thank you for coming by and stopping in to join the conversation. Thanks for sharing your story with the world. Isn’t is sad how many comments you have had of loss and heartache. Reading through all of them makes me sick to my stomach as it brings back those ‘feelings’. I finally just had to stop reading them. I too suffered a great loss 9 years ago on a rainy November. I was 27 weeks and just going in for a routine checkup and they could not find a heartbeat. My little girl’s name is Annabel Laura and she is with my sweet Jesus, thanks be to God! You are right in that all you want to DO is talk about it when it first happens. It’s healing..therapy in a way..to talk through what happen. Explore your thoughts and feelings with another person. The best thing a friend can do to help someone who has suffered a misscarriage is to let them talk about it. Ask them if they want to talk about the baby. I love talking about what she looked like, her personality in the womb, etc. .. Thanks so much for this. I do want to say that it is also nice when people remember when you lost the baby. I receive a card from my mother-in-law every year just saying, “thinking of you”. Every year when the first fall breeze strikes my face and the leaves begin to turn…I begin to remember. 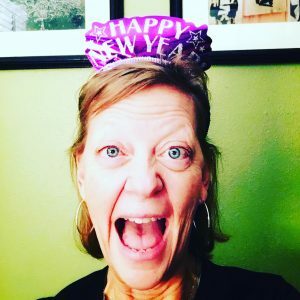 I let myself ‘remember’….the details that I usually push away…the ifs, buts and whys that I will not let myself think on during the rest of the year. All this to day…try to mark the calendar when a loved one is lost of a friend. Be it a mother, a father, a husband, a wife, a child and send that friend a note near that time to let them know YOU haven’t forgotten. I did not mean to write so much, but there it is. The Lord chose to bless me with 2 beautiful girls and I am SO thankful! I’m sorry you had to go through such a loss. I’m sorry anyone has to…..oh for the day when there will be no more death, no more tears….. So close, momma. I’m profoundly sorry for the loss you suffered. Thank you for sharing your moving and poignant thoughts with us. Like you, I am shocked at the response this post has garnered. I worried it might be too much for folks, but I am heartened by so many willing to share and lift others, even in their pain. I’m so sorry for your loss and I too look forward to the day when death does not haunt us. Thank you for sharing. I am glad to see a lot of bloggers over these past few months call attention to topics that are still “taboo” to talk about in this day & age: depression, miscarriage, stillbirth. I like that you shared your story& offered advice on what to do if anyone has a friend going through it. I just remember being annoyed at one of my friends when I told her I miscarried & she said “so, false alarm?” and I said “No I was pregnant, I just lost the baby” and she just couldn’t comprehend any of that. Omgosh…I know that folks mean well, so I have to believe that when their words pierce us, it is not intentional. This also makes a point about those who do not believe it is a baby until birth (not that she believed that, just pointing out why some my be more blase about miscarriage). I’m so sorry for your loss. Thank you for coming and commenting. Each one is a new light on the subject. It was nice to read the same words I was feeling, I know that I am not alone in the hurt and pain that having a miscarriage can cause. Thank you for sharing your story. Jennifer, I’m so sorry for your loss. It’s a difficult subject for many and the best we can do is to share our stories, so that we can heal. Thank you for sharing yours with us. I lost my first on Christmas Eve many years ago, so I know how that is to miscarry on a holiday. We had not told most of our extended family, which was mixed. Only a few knew at the holiday gathering the next day we went to knew. At work however EVERYONE knew…the few I had told had spread it far and wide and people I didn’t even knew knew were coming up and asking me me months later about “how the baby was” and I hated having to explain again and again. Same thing at church–the only people I had told there were a couple friends and two women in the nursery who I had asked advice for a obstetrician (went with one they suggested and was so glad–he handled everything well, though unfortunately the night I miscarried the doctor on call was not him but someone who frankly was quite a jerk….rushing to get off the phone to get on with his Christmas). But there was blessings in so many knowing as well…because when I came in after break and told people at work, so many women opened up about their own experience, and that really helped. And when I was sad and teary I didn’t have to worry that people wouldn’t understand. (I was working at a yearbook publisher, and there were these Senior Dedications where parents sent in all their baby pictures that just did me in a few times…I started avoiding those boxes to process). Thank you for sharing your story, Gale. It’s still tough all these years later. Just when you think you’re good, something pushes the pain and memory out in the open and you have to look at it, grieve, again. But, for me, that’s okay, especially if it means someone gains from my experience. I’m sorry you had the jerky doc, but really, thank you for sharing. My daughter had a miscarriage at the very early stages of pregnancy.. i’ve actually known a few women BUT my daughter’s was different. She had not ‘bonded’ with the baby (sounds horrible.. but it’s true) so that aspect was not painful for her. What was painful for her was that she knew she was miscarrying and did not have time to get a DNC, so she actually had to live through the process. I’ve never known the process. I mean I have ‘known’ it but I have not felt it through the words of someone that has gone through it. That’s not horrible, quite the opposite. I’m sure she felt her loss in her way, and that’s part of what I tried to convey: we have these experiences and not one is the same, but when we talk about tough subjects it get a little easier. Maybe not in the sense of our heart, but in the sense of our connections to others. Thanks for joining the conversation, Aimee.